I’ve loved Dan Howards’s art for years, ever since I saw it on a message board we were both members of. I’d always wanted wanted to commission him but things never worked out. Until now! Things came together at just the right time, and I’m very happy. He did a great job capturing the details that were important to me, like my hair and my accessories, while still staying true to his personal style. 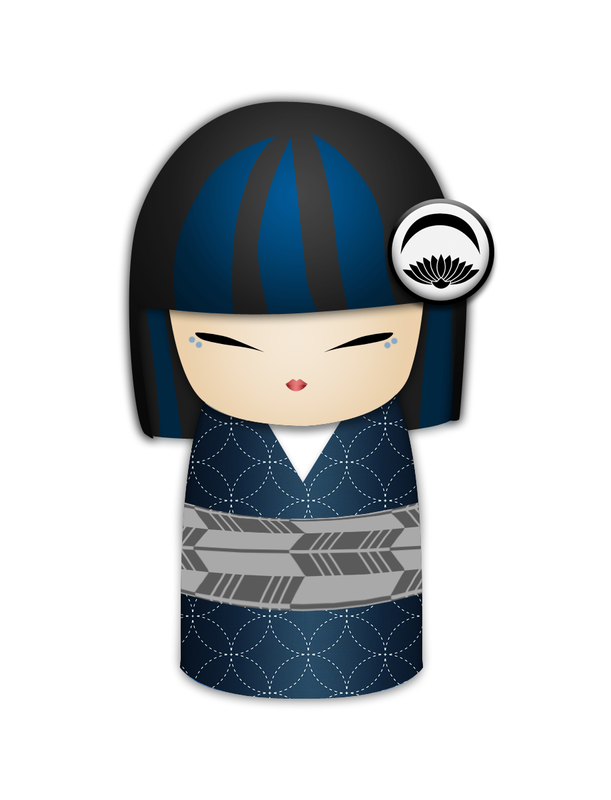 I also love the low collar of the kimono! Especially since he’d never drawn accurate kimono before and was going by some vague references I sent. The pop of red is great too. It adds a great little racy touch and contrasts so well with my beloved teal/peacock colour palette. Please go check out his work on his website, Dan Howard Art. I fell in love with illustrator Logan Spector’s art in a group on Facebook we’re both part of. I contacted her about a kimono-related commission, and I am so beyond glad I did! I absolutely love how this turned out. It’s obviously based off my recent coordination at the botanical gardens, and Logan’s attention to detail is just blowing my mind. 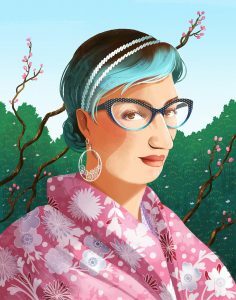 From the kimono itself to the pattern on the haneri to my glasses and earrings, everything is spot-on perfect and translated into her unique art style so well. I get really happy seeing how different artists interpret my face in their own looks while still being true to my weird nose and squishy jaw-line, and Logan was no exception. The whole process from start to finish was very pleasant, she showed me a draft and asked for input and kept me in the loop the whole time. Please check out Logan Spector’s website and Instagram! 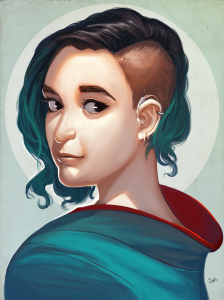 It’s been quite a while since I’ve been lucky enough to have a new portrait to share with you all! This fantastic piece was done by Melanie Georgiou (Merrie Go Art on Facebook). 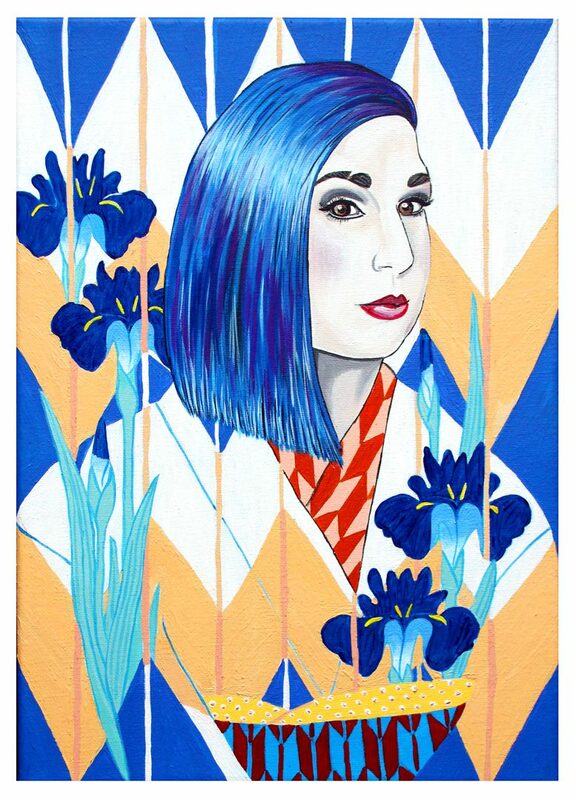 She is currently undertaking the incredibly inspiring challenge of doing one hundred portraits of kimono friends and colleagues. So far, they’re all as unique and bold and as fabulous as this one which just blows my mind. She was inspired by some of my favourite yabane pieces since we share a love of the motif, and I absolutely love that she included the iris motif since it’s one of my favourite flowers but not something I think I’ve ever mentioned. And of course, how could I not be thrilled with the bright bold blue of my hair? If only I could get it to stay this vibrant in real life! 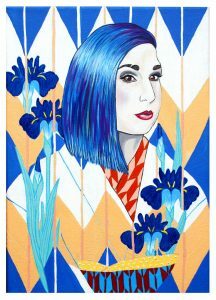 If you liked this gorgeous painting as much as I did, click here to check out the rest of the project and her other amazing creative output!